The general rejoicing amongst collectors of British music at the news that the Lyrita back catalogue was going to be released on CD was uniformly and rightly vociferous. Perhaps, just perhaps the 'new' discovery of Richard Itter's personal radio archive is a cause for even greater celebration. Before addressing the specifics of this new and very valuable disc a few other thoughts. I suspect Itter's archive represents just one - albeit in the best possible fidelity - of many compiled by Classical Music enthusiasts/hobbyists. I know for a fact my own uncle - an architect by trade - did exactly the same thing with a little reel to reel recorder, a mono radio and an aerial strung out of the window to make the most of the reception. None of these collections would exist if it were not for the BBC and their commitment - technical and artistic to the Arts in general and specifically music. You can read letters from the likes of Delius and Walton living abroad about their listening in to broadcasts of their works. What is particularly striking - and this is reinforced by every new release - is the sheer range of the music broadcast and just what a fine job the recording and broadcasting engineers did even in the earlier years. About three discs into this new series it is very tempting to put in a 'standing order' for all new releases. This new release of works by Arthur Bliss is a case in point. None of the music is new to the catalogue but the main work - The Beatitudes - remains disappointingly little known and hugely underappreciated. Before considering that there are three shorter appetisers. The first two - Madam Noy and Rout are two of Bliss's earliest works. At the time of their premieres in 1920 they were deemed rather daring and 'modernist' in much the same way that Walton's Façade was perceived as breaking down boundaries between popular culture and the Arts in general. Coming back to the music now there is a clear sense of wit and skill in the handling of the small instrumental group but revolutionary it isn't. All of these early works are collected together on a uniquely valuable Hyperion disc which is now nearly twenty years old. The fact that much of it has not been recorded again since shows the relative indifference to Bliss that sadly pervades the Classical Music world. In that context being able to hear these 1958 performances is all the more valuable. Especially since the solo soprano part is sung by one of Bliss' favoured sopranos - Jennifer Vyvyan. Vyvyan took a key role in his one major opera - also under-appreciated! - The Olympians (Opera d'Oro OPD1480 and Intaglio INCD7552) and sang the demanding solo soprano part in the world premiere of The Beatitudes. No conductor is given for the nominal 'Wigmore Ensemble' but it is safe to assume the composer's close involvement as well as Vyvyan's complete absorption of the idiom. Full texts are given in the ever-excellent Lyrita liner but Vyvyan's diction is exemplary so they are unnecessary. Likewise the BBC recording is very good indeed with fine balance between voice and small instrumental group. There is a small amount of tape hiss but technically this is very good indeed with just one or two moments of peaking distortion at the loudest moments. All the recordings on this disc are in mono but there is very good space around all the performers and a sense of front to back that diminishes any 'loss' of stereo spread. Likewise, the playing of Rout - the word being derived from the old meaning of revelry - is energetic and playful, full of bite and bounce. No surprise that Diaghilev asked Bliss to orchestrate the work as an interlude for his Ballets Russes performances. Again there is a very enjoyable performance of that version conducted by Bliss on Lyrita sung by the vibrant Rae Woodland. Coming back to orchestral version reinforces the influence of contemporary French composers on Bliss during the 1920s - the original small group has an earthier folkier feel that seems closer to the work's original inspiration. Vyvyan has a slightly heavier voice than Woodland and the Wigmore performance flows forward more than the orchestral version. Ultimately - as with all of this disc - the current performances are must-have appendices to previous versions. The Enchantress is another little-known Bliss work. Again the only other version - which was its premiere recording - is over twenty years old and was from Linda Finnie accompanied by Vernon Handley and the Ulster Orchestra on Chandos (CHAN8818). In effect this is an extended seventeen minute self-contained operatic scena. Bliss unleashes his full orchestra very dramatically and no surprise that this causes more technical problems for the 1957 recording offered here from Rudolf Schwarz with the BBC Symphony Orchestra accompanying Pamela Bowden. Finnie is very good and the Chandos recording still sounds excellent - I think their recordings in the Ulster Hall from the 1990s remain some of their finest technical achievements of that time. However, next to her Bowden is far more expressive if not always simply beautiful of tone. She inhabits the text - you believe she is a woman scorned plotting her grim revenge. It helps again that Bowden's diction allows every word to be clearly heard. Finnie is more a stream of controlled vocal production. The playing by the BBCSO is a little bit scrappy too but again Schwarz has to be credited with finding an ebb and flow to the work that ultimately makes me realise that this is a much more successful and engaging work than I realised from Handley and Finnie. In fact, the less than polished presentation has the effect of creating the impression of a woman caught in the extremes of passion. This work occupies much of the same emotional landscape as Walton's contemporaneous Troilus and Cressida and probably has been ignored for much the same reason; that the explicit emotional Romanticism of the score did not chime with the establishment musical zeitgeist of the 1950s. Even without the presence of The Beatitudes on this disc the performance of The Enchantress would make it a valuable purchase. "As the day for the premiere in May drew near, I realised I was in for a major disappointment. I had been led to believe that the performance was to take place in the majestic surroundings of the new Cathedral, but alas! the Cathedral was needed for services and the concert was relegated to the Coventry Theatre, a maladjustment most unfortunate to me. Instead of the ecclesiastical grandeur which I had imagined, there was the ugly theatre whose stage could not properly contain both large orchestra and chorus. The latter could not be placed where their voices would tell, and some of them acknowledged that from where they were wedged in they could not see my beat. Also I had written an important part for the Cathedral organ. What effect could one possibly obtain from an imported small Hammond organ? We had to do the best we could." Add to this a hard-pressed amateur chorus brought together to perform two large and very demanding new works that were beyond their enthusiastic capabilities and the result was not surprisingly disappointing. In addition the perceived success of the Britten only served to push Bliss's work further into the artistic shadows from which really it has never returned. Indeed it has been wholly absent from the recorded music catalogues until 2013 when the always enterprising Dutton released a transcription of the BBC broadcast of that first performance. That remains an important historical document and better than no recording at all but it is flawed technically and artistically and not something by which this piece should be judged alone. Interestingly, the first performance of the Britten - from within the cathedral - has also been released. Of course the War Requiem has gone on to have several major and successful recordings from which its greatness blazes forth - not something quite as apparent if judged by the scrappy first performance alone. Part of the success - on its own terms - of The Beatitudes also accounts for its failure to gain wider popularity. The musical fingerprints I mention tie the work in to a sequence of anthology-choral works that Bliss had developed right back to the 1920s with his Pastoral - Lie strewn the White Flocks. Up until that time the great majority of choral works were a setting of a single poem or prose work or poems by a single poet. Very effectively, Bliss brought together a series of texts from different poets and ages to underline the common experience of man. For Pastoral this is a celebration of nature and Spring; just two years later in 1930 he used the same technique for one of his undisputed masterpieces - Morning Heroes. Some might feel there is compositional inertia in that passages of the 1961 Beatitudes are so recognisably by the same composer as the 1930 Morning Heroes - I do not. One observation contrasting the use of soloists in the Bliss and the Britten possibly has more validity. 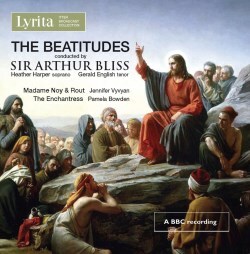 Bliss realised that the text of The Beatitudes alone was rather unvaried — "blessed are the ........" etc — so he sought contrast between the soloists in "The Beatitudes" proper and the chorus mainly featuring in the other texts. This does mean that the tenor and soprano do have music of mainly a melismatic/rhapsodic character. Britten's great piece of musical theatre was the contrasting use of the soloists with the soprano ecstatically involved in the Latin Liturgy while the two male soloists engage in the grim reality of war as expressed in the Wilfred Owen poetry before coming together in the remarkable closing Strange Meeting. That being said the two soloists, Heather Harper and Gerald English, featured here from the Proms premiere in 1964 are exceptionally good at projecting this lyrical rhapsodic quality. Better in fact than the more overtly operatic voices of Jennifer Vyvyan and Richard Lewis from the world premiere. Indeed, this gently ecstatic writing is a particularly successful feature of the work. Comparing the two performances the 'new' Lyrita one is superior in just about every regard. Both were conducted by the composer so have that stamp of authentic interpretation but technically and musically the later Proms performance is superior. Most immediately apparent is the presence of the behemoth that is the Royal Albert Hall organ. Without a score or other performance it was all but impossible to judge just what a damaging absence the little electric organ used for world premiere performance was. Here, from the very first bars the organ - with an uncredited player, thunders its presence - it is exciting and dramatic - exactly what one imagines Bliss had in mind. In fact, so mighty is its presence that it overwhelms the recording which collapses into distortion at the end of the First and Second Beatitudes just before the setting of George Herbert's Easter. Another major plus is the contribution of the massed choirs - far more blended and sounding at ease than the hard-pressed Coventry Festival Chorus. There is real light and shade here too with the big 'set-pieces' - the previously mentioned Easter being a case in point - hitting home with great impact. The BBC recording is perfectly good for the period - the far larger-scale forces testing the technical limitations of the available equipment so one is aware of occasional stresses in the recording itself. There is a significant amount of hiss and the microphone positioning sits the listener fairly well back in the cavernous acoustic of the Albert Hall. The benefit of that is the choral and solo writing blends and has plenty of space around it; the downside is that orchestral detail and weight of orchestral tone is lost. Again I find it preferable to Dutton's presentation of the premiere which seems to have been treated with some fairly extreme rolling off of the high frequencies which reduces the hiss but at the cost of a rather odd 'phasing' in the sound. The more I listen to this work the more I believe it is a major work that deserves revival. It is very well proportioned and Bliss' pacing of the drama of the work shows mastery and experience. The writing is very typical of the composer - from jittery side-drum writing and jagged brass to wonderfully angular lyrical melodies. As ever, Bliss writes complex and demanding parts for all the performers and he uses a far higher level of dissonance and harmonic complexity than might first be imagined. For a long time I have felt that Bliss is a composer who does not get the acclaim and recognition his finest music richly deserves. The Beatitudes finally 'came home' to Coventry Cathedral on 22 September 2012 - a performance yet again promoted and broadcast by the BBC - and I am kicking myself that I missed that broadcast. Along with The Olympians this is the Bliss score that is crying out for a modern - preferably studio - recording. Until then, and indeed after, this Lyrita archive recording is a valuable and much to be treasured document.